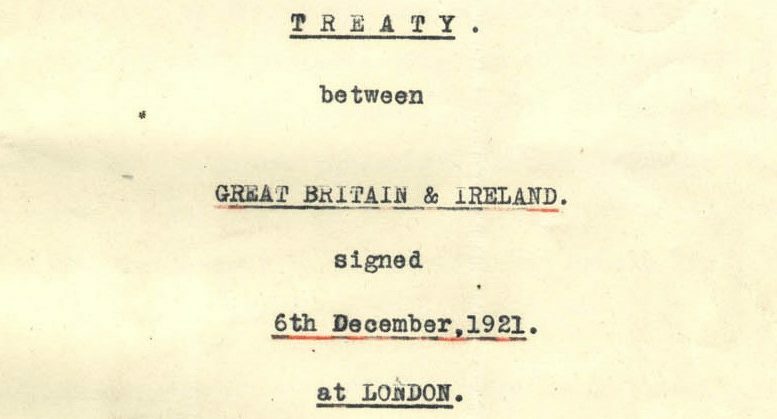 The Anglo-Irish Treaty was signed on 6 December 1921 in London between the British government and an Irish delegation. The signing of the Anglo-Irish agreement marked the end for the Irish War of independence that had started in 1919. In 1920, during the War of Independence, the Government of Ireland Act not only established the new state of Northern Ireland but gave that state the right to opt out of a future self-governing Irish Free State within the British Commonwealth of States . The Northern state consisted of the 6 north eastern counties of Ulster that had a unionist majority. They were, Antrim , Down, Armagh, Londonderry, Tyrone and Fermanagh. Belfast was to be the seat of a government that held limited devolved powers. The remaining three Ulster counties, Donegal, Cavan and Monaghan were to be absorbed within the Irish Free State and controlled from a Dublin parliament that also had limited devolved powers. Needless to say, Irish nationalists were dismayed with this plan whilst Protestant Unionists, particularly those living within the boundaries of the new state, accepted and stated to implement the Act. Sectarian attacks were launched upon Catholic homes in Belfast, Derry, Banbridge, Lisburn and Dromore. Catholics were driven from Belfast shipyards and from various engineering works in that city. Supposedly these attacks were in revenge for IRA assassinations. The IRA continued the campaign to establish a republic with the Irish War Of Independence and by the middle of 1921 both sides were exhausted and a truce was called on the 9th June. In July, Eamon DeValera, the president of Dáil Éireann went to London to meet with Lloyd George, the British Prime Minister. They agreed only that an Irish delegation would go to London to discuss terms in the autumn. 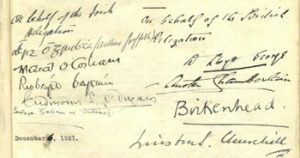 The delegation appointed by the Dáil that finally went to London consisted of Arthur Griffith (Minister for Foreign Affairs and chairman of the delegation); Michael Collins (Minister for Finance and deputy chairman of the delegation); Robert Barton (Minister for Economic Affairs); George Gavan Duffy and Éamonn Duggan, with Erskine Childers, Fionán Lynch, Diarmuid O’Hegarty and John Chartres providing secretarial assistance. DeValera himself did not go and future historians would wonder if that was because he knew he would not be able to negotiate a 32 county Irish Republic. During the debate Lloyd George was most insistent that Ireland remain part of the Commonwealth and that, Dáil Éireann members must take the oath of allegiance to the British throne. After two months of wrangling Lloyd George gave the ultimatum that a treaty be signed or that within 3 days it would be total war. It was to give Ireland a 26 county Free State with Dominion status, the right to raise taxes, regulate foreign trade, independence in internal affairs, own an army and the oath of allegiance was changed to one of fidelity. The British were to retain three naval bases within the jurisdiction of the Free State, at Cobh, Lough Swilly and at Berehaven. That the Northern Ireland boundary would be determined by a boundary commission thereby giving a false hope that large tracts of Tyrone, Fermanagh Down and Armagh along with Derry City would be given to the Free State as they had Catholic majorities. The Treaty was to displease the Catholics in the north, the unionists in the south, many of those who had fought in the struggle to achieve an Irish Republic, and even in Britain there were those who abhorred the fact that most of Ireland was to leave the United Kingdom.